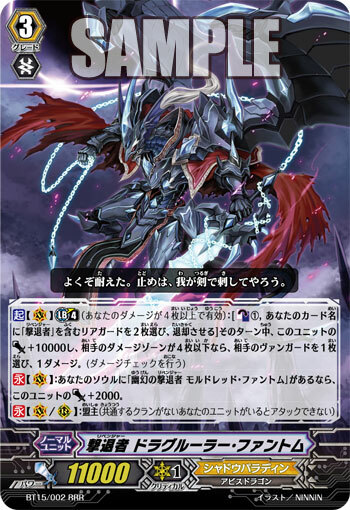 [CONT](VC):If you have a card named "Illusionary Revenger, Mordred Phantom" in your soul, this unit gets [Power]+2000. "Your resistance is admirable. But this ends now with the strike of my sword." The true form of “Mordred Phantom”, who had been shrouded in mystery. He was once the Purgatory Dragon “Phantom Blaster Dragon” who constantly raided and attacked United Sanctuary. His body and soul were judged at the hand of the Vanguard, but it turned out there were two souls inside Phantom Blaster Dragon… … His sacred soul as a Guardian Dragon and his never-ending malice as the Purgatory Dragon, and both souls were reborn… However, at this time, the world was being filled with despair. Though the malicious remnants of Phantom Blaster Dragon absorbed a vast number of negative emotions and gained a new body, the former Guardian Dragon’s soul of light continued to wander from place to place, lost with no idea of where to go. The light, in the end, came across a knight dying from fatal wounds. Both of them dying, they agreed to work together… so the light got a body, the knight got a new soul. However, he doesn’t think too much about days since past. It’s been too long for him to repent his mistakes. They are a Shadow Paladin who controls the power of darkness, but carries within in him a soul of light. A person who has accepted darkness, but yet still protects the light. "In order to prevent this world from being destroyed, I shall become the eternal shadow of the Sanctuary." Among the ranks of the “Shadow Paladins”, who work behind the scenes in the unseen side of the holy nation of “United Sanctuary”, the Revengers are a unit composed of those with incredible determination to protect their country from invaders by any means necessary. Their numbers are few, since they deal with incredibly dangerous missions that are only likely to increase, and their honor nor distinguished services for their country will never be known to the people. However, because all of them are elites carrying unparalleled determination and conviction, they have become a nearly complete fighting force under the proper leadership. [AUTO] Limit Break 4 (This ability is active if you have four or more damage):[Counter Blast (1)] When a «Shadow Paladin» rides this unit, you may pay the cost. 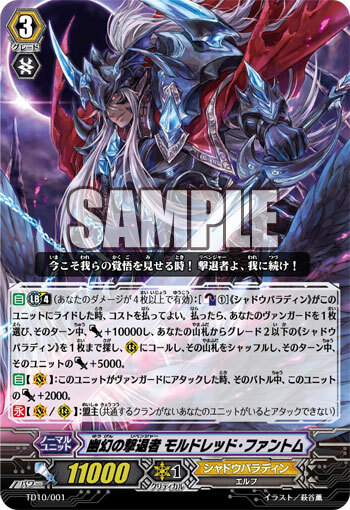 If you do, choose your vanguard, and until end of turn, that unit gets [Power]+10000 and search your deck for up to one grade 2 or less «Shadow Paladin», call it to (RC), shuffle your deck, and that unit gets [Power]+5000 until end of turn. "Now is the time to show them our resolution! Revengers, follow me!" A knight of the Shadow Paladins who leads the Revengers, warriors who have sworn to protect the Sanctuary from the evil intentions of the invaders. He is a mysterious knight who suddenly appeared like a mirage, soon after the end of the Great Civil War. He sought to save the heroes from their terrible fate, acting in secret behind the scenes, but his actions were different from those of the “Black Horse Corps”. And since he acted alone, without any aid or cooperation, his reasons for doing any of this were completely unknown. In addition, according to the elves all across the Sanctuary, they’ve never even heard the name of a Knight called “Mordred” before in their lives.”Blaster Dark” appointed “Mordred” as the head of the “Revengers”, trusting him completely even though they’ve barely talked to each other, but any of the specifics of -why- he did this are completely unknown. He is the Illusionary Black Knight of many mysterious with the name “Phantom”. Noone knows what his real intentions are as of now, even if you look him dead-straight in his scarlet eyes. "Die, everyone and everything that lives!" 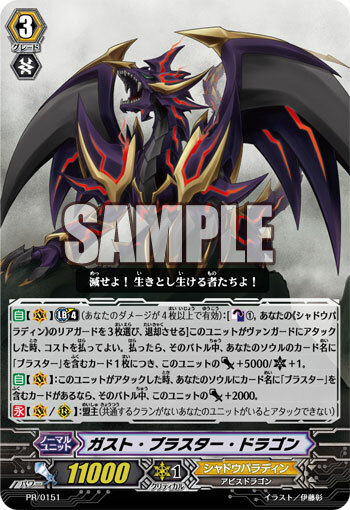 Once, many knights were tricked and manipulated by the Dragon of Purgatory, “Phantom Blaster Dragon”, who lead the group known as “Shadow Paladin”. His body and mind were judged by “Blaster Blade” who awoke as the true Vanguard, and obliterated them, but the foul beast’s malice failed to completely vanish. It continued to wander Cray far and wide, feasting on the people’s energy, slowly but surely regaining its power. Finally, it coalesced into a thick, great black fog that no one could possibly see into. Inside, the black mass began to form into a body of its own. What appeared was neither a Guardian Dragon nor the Dragon of Purgatory, but rather a wicked mass of malice. This incarnation of madness transformed the emotions and feelings it absorbed into its own power. What appeared before everyone was a blessedly evil existence, that lusted for nothing more than to choke the life out of everyone and everything that existed. “Ghast Blaster Dragon” … .. Sheer malice made flesh, desiring nothing more to corrupt and spoil the entire planet of Cray.